Sixty-five million people fling heavy balls down bowling lanes in the United States each year at speeds up to 20 miles an hour. Other than the finger holes and eye-catching colors, the balls look simple—deceptively so. At prices ranging from less than $50 to around $300, the balls are much more than solid spheres. Bowling balls are designed to perform best on various types of surfaces (lanes are not as simple as they look, either) and to compliment the style and strength of an individual bowler. Wooden bowling lanes are treated with mineral oil daily to protect them from the action of the balls. Typically, the first two-thirds of the lane is oiled rather heavily (the exact degree varies by establishment), while the final third is oiled lightly. As a result, a properly thrown ball will slide straight down the lane until it encounters the less-oiled surface, and then curve toward the pins as it gains better traction. Matching the rotational characteristics of the ball to the release style and strength of the individual bowler gives the best results. Both lawn bowling (in which balls are rolled at a target ball) and pin bowling have been played for thousands of years. The excavated grave of an Egyptian child buried 5,200 years ago yielded a set of stone pins apparently used for a form of bowling. Lawn bowling was quite popular in Europe during the Middle Ages. In 1366, King Edward III outlawed the game so his troops would pay more attention to their archery practice. Similarly, ninepin bowling (with the pins arranged in a diamond pattern) was outlawed in Connecticut and New York during the early 1800s because it was associated with heavy gambling. This led to the addition of a tenth pin (arranged in the now-common triangular pattern) to circumvent the law. Lawn-bowling balls are either weighted or shaped asymmetrically so that they will curve when rolled. Balls used in pin bowling must be exactly round in shape, but they contain hidden weights that affect their balance and rotation. They also differ from lawn-bowling balls by having finger holes; they may have two (for the thumb and middle finger) or, more popularly, three (for the thumb and middle and ring fingers). When a bowler purchases a ball, the holes are drilled to fit his or her hand. Historically, most bowling balls were made of Lignum vitae, a very hard wood. In 1905, the first rubber bowling ball (the Evertrue) was produced, followed nine years later by Brunswick Corporation's rubber Mineralite ball. Hard rubber balls dominated the market until the 1970s, when polyester balls were developed. In the 1980s, urethane bowling balls were introduced. Around 1990, dramatic changes were made in the design of the ball cores (dense blocks within the ball that modify the ball's balance). Shortly thereafter, reactive urethane was introduced as a new coverstock (the ball's surface layer) option. Also referred to as resin, the new reactive urethane coverstock was used in combination with innovative core designs, drastically changing the sport. During the first full winter season in which reactive balls were used, the number of perfect games (12 successive throws in which all 10 pins are knocked down) increased by nearly 20%—the American Bowling Congress reported 14,889 in 1991-92 and 17,654 the following year. Some examples of core shapes are lightbulb, spherical, and elliptical. Combination cores are made by enclosing a core of one shape and density within a second core of another shape and density. The main core may be supplemented by adding a collar or weight block to the core or by embedding small counter-weights separately in the interior of the ball. Since about 1993, bowling ball manufacturers have been using computerized design software to generate frequent improvements in core design. Designs have become so sophisticated that even for one model of ball, a different core design may be used for different ball weights (e.g., one for 12-and 13-pound balls, another for 14-pound balls, and a third for 15-and 16-pound balls). A developmental chemist working for a major manufacturer was quoted in a 1996 Design News article as saying, "Not long ago, a company could introduce a good ball and keep the market for two years. Now products come out so quickly that you need to have new designs ready all the time." Manufacturers currently use three types of plastics as coverstock material. Polyester, the least expensive, produces the smallest amount of hook on the back third of the lane because it is relatively unaffected by varying amounts of oil on the lane surface. In the middle of the price range, urethane balls offer more hooking action than polyester balls but are more durable and require less maintenance than reactive urethane balls. At the top of the price scale, reactive urethane (resin) balls provide the greatest hooking ability and deliver more power to the pins on impact. Various ball manufacturers have formed alliances with chemical suppliers to formulate proprietary materials by blending various resins with urethane. Cores are made by adding a heavy substance such as bismuth graphite or barium either to resin, making a very dense type of plastic, or to a ceramic material. An article written by ball manufacturer Track Inc. asserts that fired ceramic cores result in harder-hitting balls because no energy is absorbed by the ceramic part of the core. It also explains that fired ceramic cores cannot be altered during finger-hole drilling, whereas cores made of millable ceramic alloys can be. Millable ceramic alloys are made by blending ceramic powder with a binding agent. These types of ceramic cores are softer and less adhesive than fired ceramics, and that they do absorb energy upon impact with the pins. In some balls, 2-4 oz (56.7-113.4 g) of iron oxide is used as a weight block to shift the ball's center of gravity toward one side of the core. Zirconium is used by one manufacturer for counterweights. Between the early 1800s and the early 1990s, most bowling balls were made of three-piece construction. A small amount of dense material was poured into spherical core mold to create a pancake-like core. Then the remainder of the core mold was filled with a less-dense core material. Finally, the core was centered in a mold and a layer about 1 in (2.54 cm) thick of coverstock was poured around it. Since being pioneered by manufacturer Faball Inc. in the early 1990s, a two-piece construction method has become more popular. 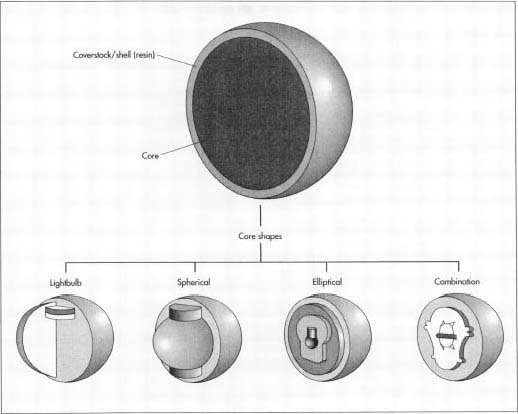 1 For the particular model of ball being manufactured, a mold is formed to the core shape developed during the computerized design process. The appropriate material is poured into the core mold and allowed to harden. The solid core is removed from its mold. 2 A second step may be necessary to finish the core. For example, some ceramic cores are fired in a kiln. A compound core may be formed by inserting the first core into a second mold and pouring material of a different density around all or part of it. mold. The core is attached to a pin that projects inward from the shell of the mold. The pin holds the core in the correct position. If the pin points toward the center of the mold, the core is said to be pin in; if it is tilted away from the center, the core is pin out. 4 The coverstock material is poured into the mold, encasing the core, and is allowed to harden. The thickness of the coverstock may be as little as 1 in (2.54 cm) or as much as 2 in (5.08 cm), depending on the design of the particular ball. 5 When the ball is removed from the coverstock mold, there is a hole where the core-holding pin had been. A plastic dowel is inserted into the hole and cemented in place. The pin is a different color than the coverstock. After the ball has been purchased, the pin will be used as a guide for positioning the finger holes to take advantage of the core design. 6 Fill material is added to the logo imprint that was molded into the ball. This may be the same color as the pin, or it may be a different color. The logo is located at the top of the ball, that is, above its center of gravity. 7 The ball is finished to the proper size specification by turning it on a lathe and shaving off enough coverstock to achieve the right shape or it may be done on a centerless grinder that scours the ball into the desired size and roundness. 8 Finally, the surface of the ball is finished to the desired texture. It is sanded to either a matte finish or to an appropriate degree of polish, indicated by the roughness of the sanding material (generally ranging from 240-600 grit). 9 The ball is boxed and shipped to the company's distributor. When the American Bowling Congress (ABC) was founded in 1894, one of its primary missions was to standardize the sport by developing equipment specifications. The current rules require a ball to have a diameter between 8.500-8.595 in (about 21.6-21.8 cm), and to have a weight of 16 lb (about 7.3 kg) or less. No minimum weight is specified, and some balls weigh as little as 6 lb (about 2.7 kg). In order to earn the ABC/WIBC (Women's International Bowling Congress) seal of approval, sample balls of each model must be sent to the ABC for testing and verification of meeting the official standards. In response to the dramatic changes in ball designs that began in the early 1990s, the ABC issued additional regulations in 1994. For example, the new rules establish limits on the ball's radius of gyration, which is the distance between the ball's rotational axis and its center of gravity. The rule limits this value to 2.430-2.800 in (6.2-7.1 cm). Other ABC specifications govern such technical characteristics as the ball's coefficient of restitution (a measure of the energy transferred from the ball to the pins), surface hardness, and hooking potential. The dramatic innovations in bowling ball design and materials since the early 1990s have been credited with leveling the playing field for bowlers of all sizes and strengths. Writing in Popular Mechanics magazine, John G. Falcioni noted that some bowlers unhappily refer to the new-generation balls as cheaters. He summed up the impact of ball refinements by writing, "The sport has become so sophisticated that knowledge of engineering and physics is likely to prove more helpful in throwing strikes than doing curls with a dumbbell." "CAD Helps Bowlers Improve Their Form." Design News (August 26, 1996): 29. Falcioni, John G. "Strike Force." Popular Mechanics (March 1994): 60-63+. "Ball Tech. Bowling This Month magazine. http://users.aol.com/phorvick/balltech/htm (15 Feb. 1998). "Bowling Equipment Specifications." Bowling Page-Information. http://www.icubed.com/users/allereb/equip.html (15 Feb. 1998). "Frequently Asked Questions." 19 Aug. 1995. Bowling Page. http://www.icubed.com/users/allereb/faq.html (15 Feb. 1998). "Reactive, Urethane & Polyester. Match the Ball to the Conditions." The Complete Bowling Index. http://www.bowlingindex.com/products/balls/balls.htm (15 Feb. 1998). "Why Use a Ball with Ceramics?" The Complete Bowling Index. http://www.bowlingindex.com/products/balls/ceramic.htm (15 Feb. 1998).